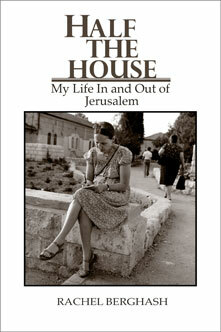 Rachel Berghash’s lyrical, impressionistic memoir charts her relationship with her homeland during a lifelong journey of self-discovery, beginning with a child’s-eye view of Jerusalem’s mysteries, her family’s religious orthodoxy, and the underlying kinship between Israelis and Palestinians. At eighteen, she serves in the Israeli army, later attends the Rubin Academy of Music, and works as a secretary at the Israeli Parliament and The Jerusalem Post. When she marries an American artist, she moves to New York City and raises a family. Living outside the homeland she loves and having abandoned her adherence to religious strictures, she shuttles between her original and adopted countries. Touching on issues of emigration, exile, family, and reawakening to religion, Half the House shows how Berghash builds a new house of the spirit, drawing on the foundation of her past while embracing her life’s new possibilities. "Half the House is the tale of a woman's odyssey to accommodate the spiritual mysteries of her birthplace (Jerusalem) and the intellectual freedoms of her adopted city (New York). Rachel Berghash shows how, in a life long struggle to be faithful to both, she made them one. An evocative and engaging memoir." —Clinton Bailey, author of Bedouin Poetry from Sinai and the Negev.